Why don't you @Inject or @EJB the calc ejb? remote-ejb and sample-ejb both have their own copy of CalculatorLocal in them. 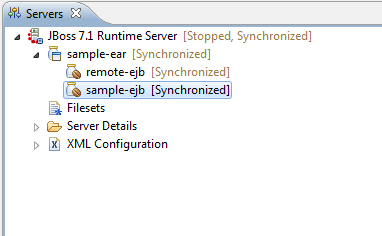 Remove the copy from remote-ejb, or better yet, package these EJBs all in the same jar. or package the common/interface classes into EAR/lib/x.jar, as a shared application library jar.